Looking for a different Castle Cary? Try Castlecary Roman Fort or Castlecary Tower. Both the castle and town of Castle Cary were founded shortly after the Norman Invasion most probably by Walter Douai. A stone Keep was added soon after the castle's construction and, when the fortification was besieged by King Stephen during the Anarchy, it resisted all attempts to take it by storm. Today only earthworks remain. 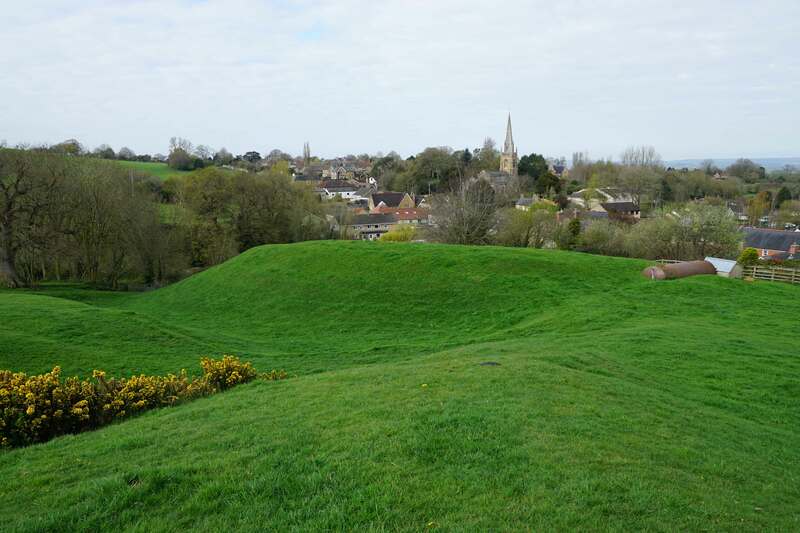 At the time of the Norman invasion, Castle Cary was an agricultural settlement owned by Alsi, a landowner with several manors in Somerset. Following William I's victory at the Battle of Hastings (1066), it was seized by the Crown and was subsequently granted, along with other lands in Devon and Somerset, to Walter Douai, a Norman Knight who had participated in the invasion. It was either he or his son, Robert, who built the first fortification at Castle Cary and founded the adjacent town. The intent was undoubtedly to secure control of the River Cary, a key artery that facilitated trade and movement through eastern Somerset. 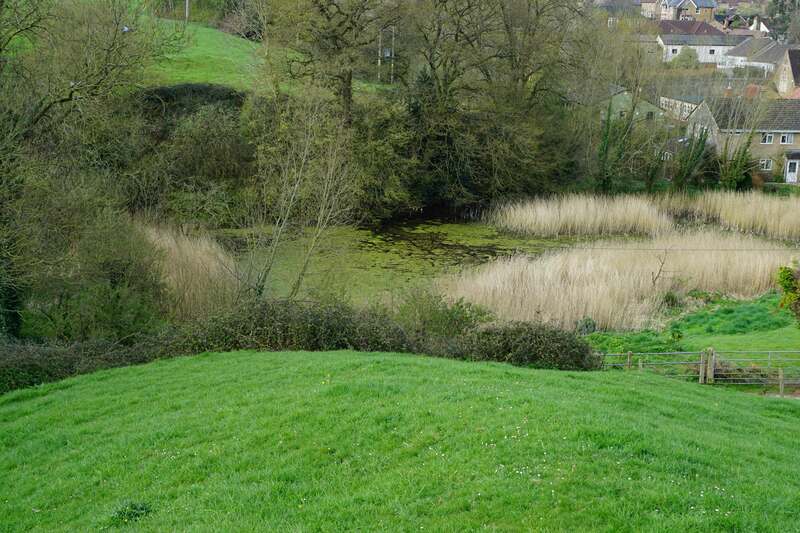 Castle Cary was placed to dominated the source of the river whilst lesser fortifications, at Downend Castle and Wimble Toot Castle, ensured control downstream. Castle Cary was also well placed to exercise control over the River Brue, which was located around one mile to the west of the fortification. 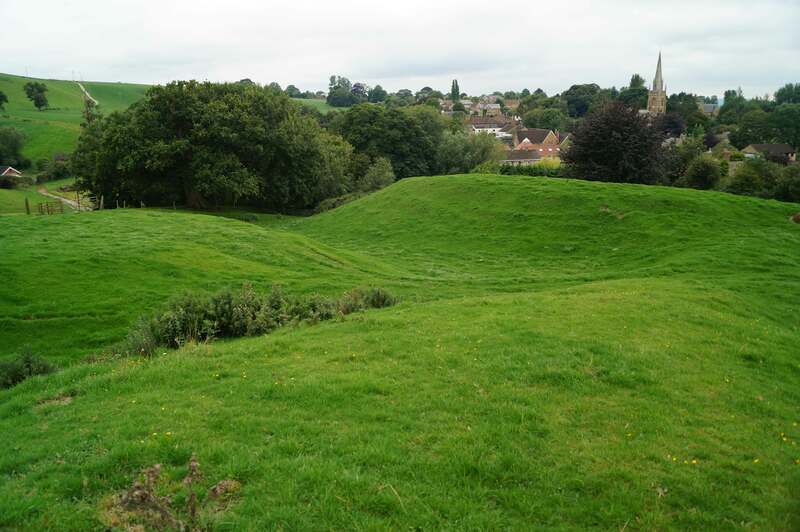 The castle was an earth and timber ringwork structure built upon Lodge Hill overlooking the adjacent town and the source of the River Cary. 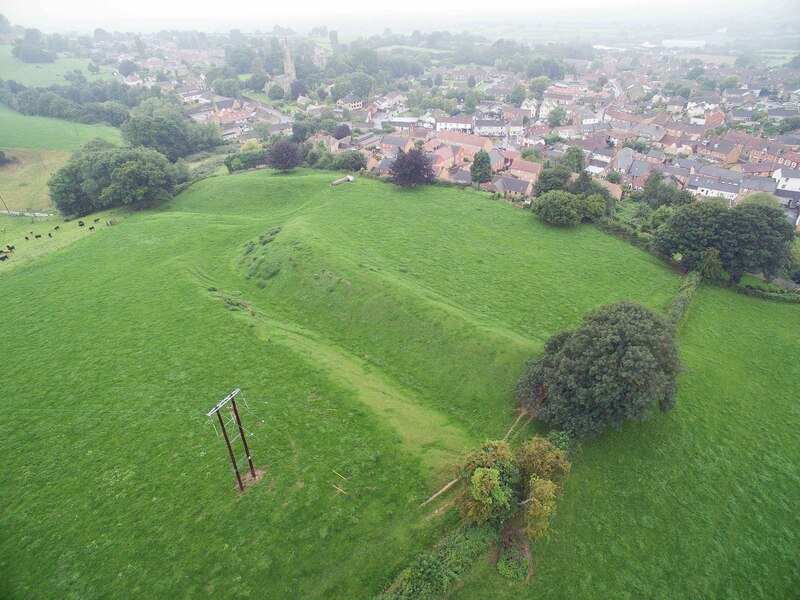 Possibly re-using a temporary D-shaped earthwork erected at the time of the Norman invasion, the castle consisted of north and south wards. A rectangular stone keep was added within the southern ward shortly after the castle's foundation. 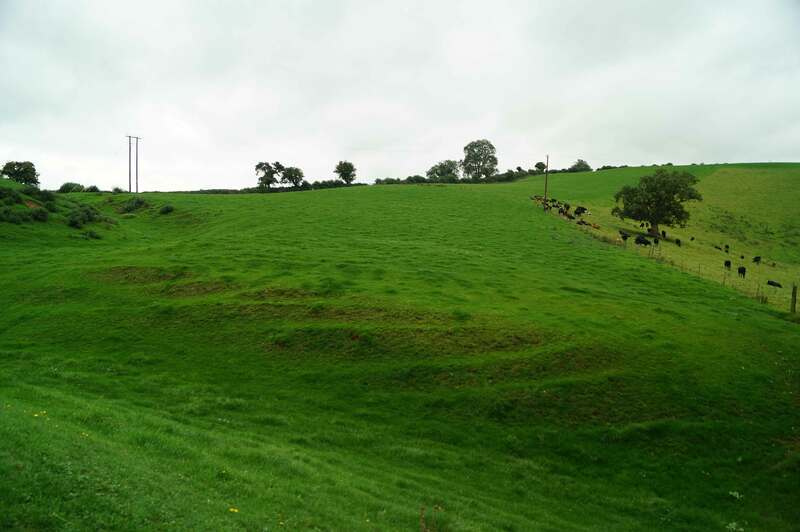 The earthworks around the tower were later modified to give the impression of a motte. Robert rebelled against King Stephen in 1136 due to a land dispute over ownership of Uffculme which was claimed by both Robert and Glastonbury Abbey. The church had won the dispute in the courts but Robert clearly felt aggrieved particularly as the Abbot was Stephen’s brother, Henry of Blois. Robert was summoned to the King and initially did homage to him including accepting the verdict of the court. But he then sped away from the Royal court to Bampton Castle in Devon where he plundered the surrounding countryside and strongly garrisoned the castle against the King. Robert's rebellion was the first of Stephen’s reign and took place several years before the country descended into civil war. Had Robert bided his time, he probably would have achieved his aim but instead his rebellion was not widely supported by other magnates and Stephen seized the opportunity to eliminate him. An army headed by the King himself laid siege to Bampton which was held by Robert's son. Early in the siege one of the defenders was caught trying to escape and was hanged in front of the castle walls which took the fight out of the remaining members of the garrison who surrendered. Robert fled into exile where he disappeared from the historical record other than a tantalising reference in the Gesta Stephani, a history of King Stephen’s reign written by an anonymous twelfth century author, which records he “met a dreadful end among strangers”. Robert's lands were then seized by the Crown. Stephen granted Castle Cary to Ralph Lovel but it proved a bad choice. In 1138, as England descended into civil war over the right of succession, Ralph sided with Matilda's forces against the King. A furious King Stephen, who had been besieging Bristol, shifted his efforts to Castle Cary. Despite a fierce assault the castle withstood the initial attack but was ultimately starved into surrender. However Stephen's forces were defeated at the Battle of Wilton (1143) and castle Cary once again fell into rebel hands. Recaptured in 1148 on behalf of the King by William Fitz Robert, Earl of Gloucester it would then remain in Royal control until the end of the war. The Anarchy was eventually settled with an agreement that Stephen would remain King for life and thereafter be followed by Matilda's son, Henry of Anjou. His accession to the throne in 1154 saw the Lovel family able to reclaim Castle Cary. Rather than rebuild the castle, they built a new fortified manor immediately to the west. This was occupied for several hundred years before being demolished in the eighteenth century. Thereafter the site was abandoned with the remaining masonry plundered for use elsewhere. Burrow, E (1924). Ancient Earthworks and Camps of Somerset. Cheltenham and London. Salter, M (2002). The Castles of Wessex. Folly Publications, London. Castle Cary Castle survives as earthworks although all traces of the stone Keep have now vanished. Public footpaths run across the site. Castle Cary. The site of the castle (centre of picture) with the town of Castle Cary beyond. Castle Layout. The castle may have used existing earthworks but was ultimately divided into two separate wards. The large northern ward (to the right) was broadly rectangular and would have contained the ancillary buildings. The small southern ward (top left of picture) contained the large rectangular stone Keep. High Ground. Whilst the castle itself towered over the town, the fortification was overlooked by higher ground. Whilst this was around 400 metres to east, twice the effective range of thirteenth century artillery, the introduction of gunpowder soon improved ranges. This partly explains why the castle did not continue as a functioning fortification in the later medieval period. Pond. A large water feature to the south of the castle would have served a defensive and economic function. Castle Entrance. The remaining earthworks do not give us a complete picture of the castle's layout. However, it is likely either the main entrance or a postern gate was here adjacent to the Southern Ward and overlooked by the Keep. Castle Cary Castle overlooks the town. It is recommended visitors use one of the town car parks (nearest one is shown below) and then walk. The main footpath to the castle is found at the Woodcock Street/Fore Street junction where there is an information panel pointing the way.